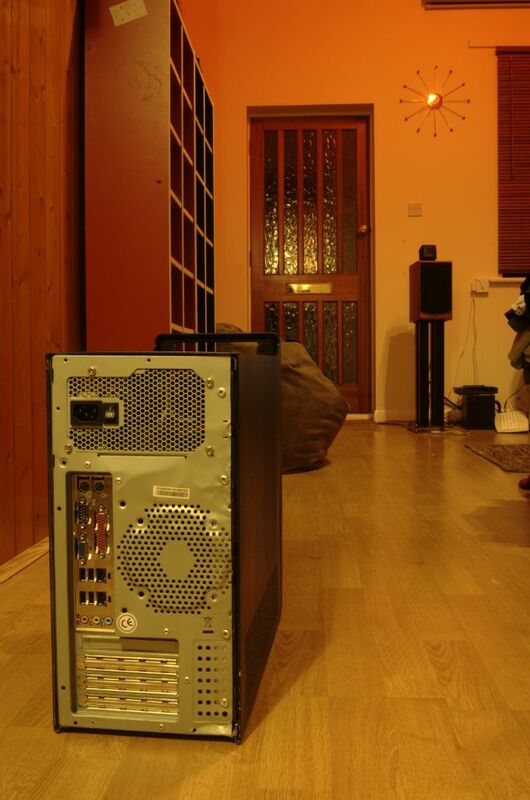 Early in 2008 I was mulling over the idea of upgrading my aging PC when a project fell into my lap. A work colleague had upgraded the PC of a small manufacturing firm. They had been using the same machine for CAD work since they had bought it in 1993. It had served them very well but after fifteen years was showing it's age. So my colleague bought it back one day, a deal was done and it was now mine. 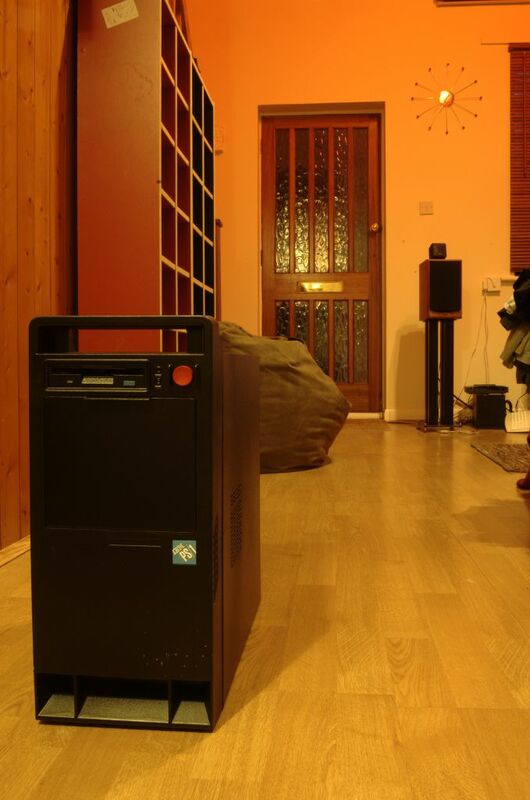 The PC was an IBM PS/1 Tower, presumably a 2168 series which are the only ones which came in tower form. The case was clearly very well designed, with a strong handle to carry it with (perfect for lugging around the office... or to a LAN party! ), and the underside even has a cutout so they can be stacked. I have to confess that I didn't actually take an inventory of the former contents, just gutted it, although I believe it was running a 486 at 25Mhz with roughly 8MB RAM. 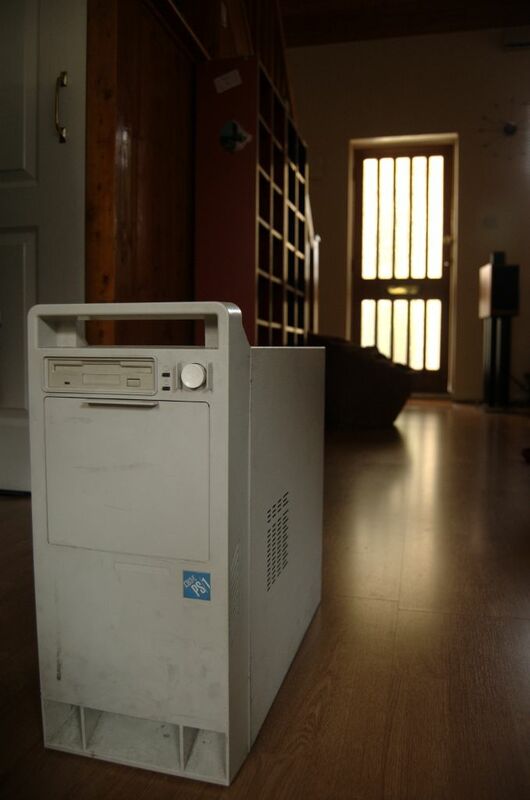 I had immediately fallen in love with it's simple industrial design, not knowing at the time it was designed by Richard Sapper who also designed the Thinkpads for IBM. I'm now lusting after a Tizio lamp for my desk which was also designed by Richard Sapper but alas at �160 for the micro version and �230 for the standard size it's a little racy. 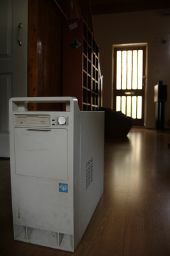 I had read somewhere that the machines only came in beige, apparently something to do with German office regulations. I felt it was time to remedy that! 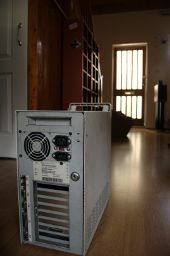 The case had it's manufacture date printed on the inside - May 2003 making it AT form factor, getting an mATX motherboard in there was going to be a challenge, but I got out my drill, my dremel and went to work. I had to drill off the back plate, which was spot-welded on, because the entire plate was utterly different to an ATX layout. So off that came. I then picked up a Cooler Master Elite 340 mATX case for �25.00 from which to build my new case. I used the back plate from the CM case and rivetted it to the PS/1 case, and also used the cross-bar from the CM case to strengthen the new back plate. 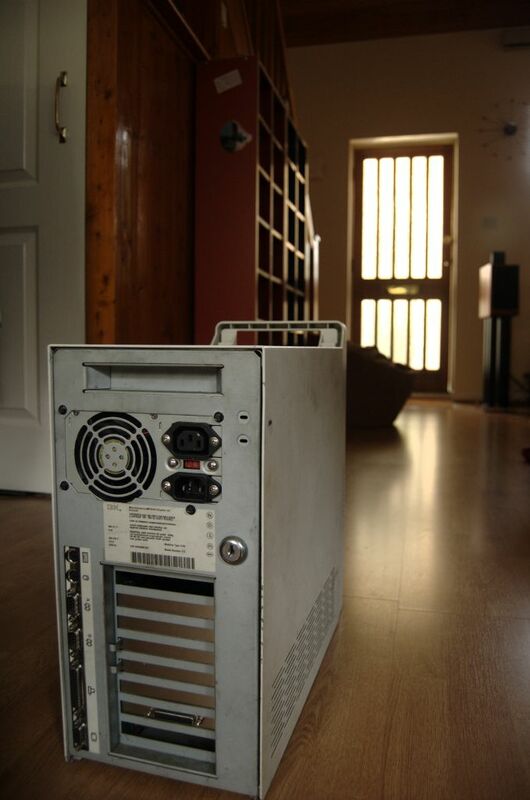 I then had to cut off some bits from the internal chassis of the PS/1 (for example the HDD used to mount where the PSU needed to be now) I then proceeded leave the project alone until I found some hardware to match the new case's awsomeness. I was pretty much convinced it would be Intel, possibly the shiny new Core i7 stuff, but then the Phenom II was released and it appeared to be just what I needed - nice and cheap with good performance. I combined that with an okay AM2+ DDR2 motherboard with the possible intention of upgrading to AM3 DDR3 if it seemed like a good idea in the future. 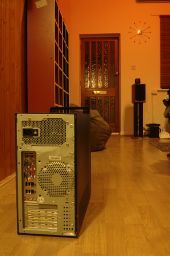 I planned on installing Debian on it, and figured I might as well go for 64bit so also picked up 4GB of DDR2 RAM. 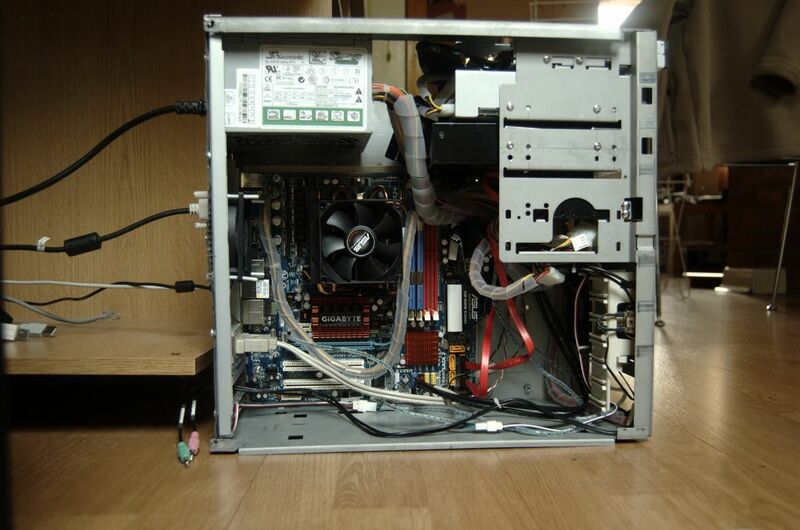 I used the motherboard tray from the CM case and mounted it (loosely) in the case. It fit! Hurrah! I used the original LEDs and button (although I had to modify the switch as it went directly to the PSU). In the meantime I had spray painted (not very well) the case black, with some blue features, and the power switch red - very Thinkpad-esque I think. I would like to think Mr. Sapper would approve ;). Once it was all done I grabbed my Debian Squeeze netinst CD and ran the install, and now have a very nice, fast, pretty workstation! The install went fine - all the hardware was detected first time. I then did an Rsync to get my stuff from my old PC, and Robert's your father's brother. I'm using Gnome now and although it's taking a little getting used to, I'm starting to see the light and even like it (this was still written in vim mind ;) ).